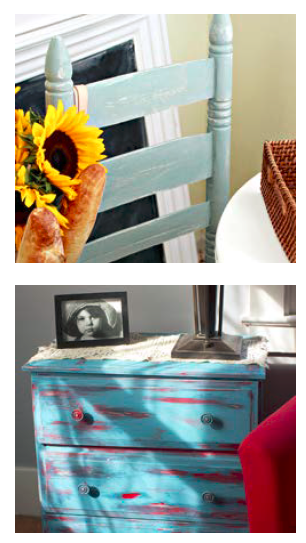 Putting the shabby in “shabby chic” is nearly impossible to mess up. With minimal effort, you can achieve maximum results, and transform forgotten furnishings into heirloom statement pieces. If you haven’t yet worked with Chalk Paint, you may find our Chalky Finish 101 Tutorial helpful to read first. If you’re ready for a master class in effects and techniques, let’s go! This is the least distressed of the possibilities, and a great way to warm up to the mediums. For a subtle worn look, simply graze the edges of your final coat with sandpaper or water. If the piece was originally a dark stained wood, that will start to reveal itself during the distressing . Distressing with Sandpaper – Once the paint is dry, gently trace along the edges using a fine (220) grit sandpaper or sanding sponge. Concentrate on areas where natural wear would occur, like corners and edges, or to highlight wood-carved details. Accidents are easy to recover from. If you’ve removed a bit more paint than you intended, just dab a bit more paint back on to reign it in. Finish with the Clear Crème Wax or your choice of varnish. Now we’re starting to get a bit more adventurous! Here, you’ll want to take it a bit further with the Deep Brown Crème Wax. Take your desired colour to the finish coat, distress the surface, and finish as usual with the Clear Crème Wax. Then, apply the darker Crème Wax to deepen the colour that much more, and add a muddy-ing effect. If the effect turns out darker than you’d like, simply apply more Clear Crème Wax to counteract the dark finish. Crackle Medium is a clear gel that can achieve some amazing textures and colour contrasts. Guaranteed to be more fun than watching paint dry is watching paint dry while the Crackle Medium does its thing. Consider a base coat in white (AmericanaDecor’s “Everlasting”), and a top coat in black (AmericanaDecor’s “Carbon”). With a layer of Crackle Medium in between, the black paint on top will split in all the right ways to let the white undercoat show through. Crackling can be achieved in any colour combination. The Crackle Medium can also be applied to bare, natural wood, which will allow the wood tone to show through your selected top coat colour. You’ll start to get the hang of how the brush strokes create the crackles, so play with it and have fun! That’s the spirit! 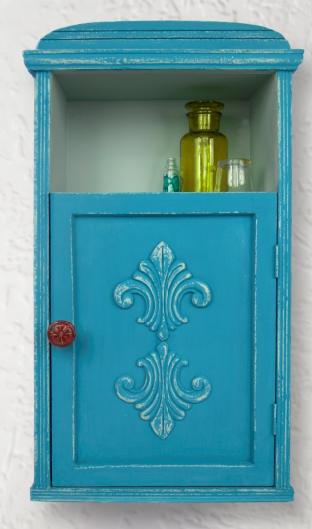 There is so much potential with chalk paint to create a truly unique piece. Any colour can become your basecoat, not only the natural tones of the furniture wood. First apply the colour you would like to “reveal” underneath. Then, apply paraffin wax or petroleum jelly on the areas you would like to appear distressed. When completely dry, sand where the wax was applied to remove the top layer of color and allow the base color to show through. If you’re feeling really brave, you can go freehand, and simply brush a contrasting paint colour onto a fully dried base coat. This is called “dry brushing” and is best done with a bristle paint brush. Load your brush with the new colour, remove the excess with a rag or paper towel, and lightly drag your paintbrush across the surface. Actually, that’s it. The only rules. So have fun!